MGM National Harbor, a subsidiary of MGM Resorts International, opened a 1.4 billion dollar Las Vegas-style casino in National Harbor just south of Washington DC on December 8, 2016. 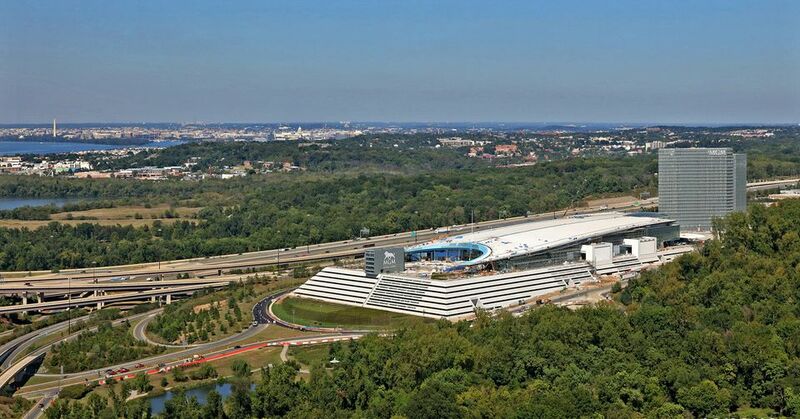 The resort casino is located in Prince George’s County, Maryland in a waterfront development along the Potomac River. The Theater at MGM National Harbor features live performances by an incredible lineup of entertainers including Bruno Mars, Boyz II Men, Cher, Duran Duran, Lionel Richie, Ricky Martin, Sting, Earth Wind & Fire and many more. While the casino attracts visitors interested in gambling, the resort offers comfortable accommodations, great restaurants and entertainment, and a convenient location making it an ideal destination for everyone. Check out the restaurant menus and make advance reservations. The restaurants are great but can get very busy during prime visiting hours. The National Market offers a variety of fast-casual options as an alternative to fine dining. Take time to wander around, explore and visit the shops. Look at the entertainment schedule and buy theater tickets in advance. Watch others at the table games before participating yourself. Learn the rules and gamble responsibly. Address: 101 MGM National Avenue, National Harbor, MD. If you're driving, the casino is accessible from I-295 (Exit 1B) and I-495 (Exits 2A-2B). Parking: While the resort will charge for parking in the future, self-parking will be complimentary during the opening period. Valet parking is available 24-hours per day. Registered hotel guests enjoy in and out privileges. The parking lot accommodates 5,000 vehicles. There are five entrances and exits. Public Transit: The resort is accessible by Metrobus, but not by Metrorail. The closest Metro stations are King Street (Alexandria-Yellow Line) and Southern Ave (Maryland-Green Line). From King St, take the NH2 Bus, From Southern Ave, take the NH1 Bus. The Bus, operated by Prince George's County Transit provides transit to National Harbor on Routes 35 and 35S. The resort accepts room reservations via mgmnationalharbor.com or (844) 646-6847. Each of the 74 suites, ranging in size from 588 to 3,210 square feet, offers a distinct location, size, layout, and amenities. Guests appreciate the elegant contemporary decor and the floor-to-ceiling windows. The largest accommodations feature spectacular views of the Washington DC skyline as well as expansive spaces that are ideal for a social or business gathering. The suites are as follows: Executive Suites (588 square feet), King Suite (797 square feet), Corner Suites (958 square feet), Executive Corner Suites (1,465 square feet), Capital Suites (1,536 square feet), Presidential Suite (2,462 square feet), Chairman Suite (3,210 square feet). FISH - The seafood-focused restaurant concept from acclaimed Chef José Andrés features local favorites such as Maryland blue crab and oysters from the Rappahannock River, as well as traditional seafood dishes from around the world. The bold and colorful space brings guests close to the action with an interactive dining experience, including a seafood bar and a wall of aquariums and tanks showcasing the day's catch. Voltaggio Brothers Steak House - The restaurant is by acclaimed chefs Bryan and Michael Voltaggio, known for their shared successes on Bravo's Top Chef. The menu features both familiar and nuanced offerings such as dry-aged cuts and playful riffs on classic steakhouse fare including shrimp cocktail, wedge salad, and the twice baked potato. Ginger - A Pan Asian restaurant, Ginger offers authentic cuisine from regions throughout the continent including Japanese, Chinese, Thai, Vietnamese and Korean menu selections. Warm organic wood interiors create an inviting space along with traditional dishes, such as dim sum, congee, curry, fried noodles, and kimchee, that bring memorable dining experiences for those seeking a genuine taste of the Orient. TAP Sports Bar - The high-energy restaurant and sports bar emulates the popular Las Vegas hotspot. Guests enjoy the latest sporting events while surrounded by memorabilia from beloved local sports teams including the Washington Capitals, Washington Wizards, Baltimore Ravens, Washington Redskins and Washington Nationals. The menu features American sports bar favorites with a local touch such as lobster beignets, Maryland crab soup, burnt ends BBQ pork baguette and Maryland crab cakes. Bellagio Patisserie - Paying homage to the iconic European-inspired pastry shop at Bellagio in Las Vegas, this wonderland of sweets features pastries, Danishes, gelato, coffee drinks and retail items to take home. The focal point of the space is a 26-foot-high chocolate fountain circulating nearly two tons of melted chocolate – a replica of the famed display at its Las Vegas namesake. National Market - Inspired by the current trend in fast-casual dining, National Market is a food market dining experience offering approachable cuisine at an affordable price. The market includes ten venues, offering an open floor plan and indoor and outdoor seating that overlooks the Potomac River. Venues include Pappas Crabcakes, Amo Los Tacos, Bahn Mi Vietnamese Kitchen, Bento, District Deli, GWBW George Washington Beer & Wine, Honey’s Fried Chicken & Donuts, Shake Shack, S’Cream and Zizi’s Pizza. Felt Bar & Lounge - The indoor/outdoor lounge features artisanal cocktails, house-made mixers, and craft beer. There is live music, DJs, and oversized plasma TVs. Felt also features a 1,000-square foot outdoor patio with an outdoor fire pit and a view of the Potomac River, Old Town Alexandria and parts of Washington, DC. Blossom Cocktail Lounge - The lounge is open 24 hours serving a full bar menu. The decor evokes the scenery of the gorgeous famed cherry blossoms in Washington DC. A 3,000-seat theater features A-list performers and presents high-profile events. Ticketing is handled exclusively by Ticketmaster, a Live Nation Entertainment, Inc. company. Performances include world-class concerts, comedy shows, cabaret-style acts, boxing events, and more. The Theater at MGM National Harbor features reconfigurable seating options that allow custom arrangements for each event, from a traditional concert layout to a 360-degree configuration for boxing. National Harbor is a developing neighborhood located along the Potomac River with convenient access to Washington DC and Alexandria, Virginia. The mixed-use community includes hotels, restaurants, retail stores, condominiums, a full-service marina, the Gaylord National Resort, and Convention Center and commercial office space. MGM Resorts is one of the world's leading global hospitality companies, operating destination resorts around the world including such iconic Las Vegas resorts as Bellagio, MGM Grand, Mandalay Bay and The Mirage. The company also operates MGM Macau and has many other partnership projects under development in China, India, the Middle East and other destinations around the world. All About the Casinos Near Washington, D.C.